Specialized OptoMOS single-pole, normally open Solid State Relays (1-Form-A) with an integrated current limit feature that can replace electromechanical relays while enhancing the robustness of wireline interface applications. The active current-limit circuitry in these relays also has a thermal management feature that provides excellent power cross immunity for improved survivability in harsh environments. These features greatly improve the robustness of end systems that use these devices, when compared to systems using relays without integrated current limit. 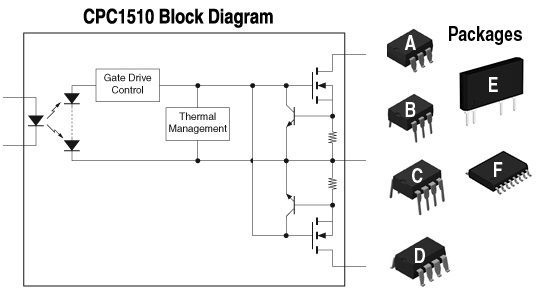 These devices may be used in both unidirectional DC applications as well as bidirectional AC applications. CPC1540, CPC1563, and CPC1593 incorporate an additional safety feature, Voltage Triggered Shutdown, VTS, that quickly shuts the device down if a voltage transient, above the VTS threshold, occurs in the load while current limiting is in effect. These devices are ideal for use in noisy environments where such transients can be expected. CPC1560 is available in 8-pin DIP and surface mount packages; CPC1510, CPC1540, CPC1563, and CPC1593 are available in 6-pin DIP and surface mount packages. * VTS feature active only when device is in current limit.